Did you notice any change in this blog? Well! Check the URL. Yes it is a separate entity now. The old blogspot link will automatically pull you to this new website. Nothing has changed.This blog would still have all the humor and emotions packed and I will try my level best to make my readers have a smile on their faces when they read my posts. Keep the upward curve :) intact. Well I also figured out that my blog is worth this much. Anyone willing to buy my blog? If so, you stand a chance of getting this underwear free along with the blog. Chronicwriter will be soon in the papers too... If you want to know the reason, all I can say is wait for one more week. and yes.. sometimes when people advice it stays on for long and just lifts us up... aint it ? Chrizzzzzzz you are such a CELEB!!!! woooop! cant wait to see what you got going on! r ya a celeb now or is it just Photofunia? LOL! I guess u too are gonna release ur book isnt ? I feel so happy for u.
Wishing u all the luck and God bless. bro. 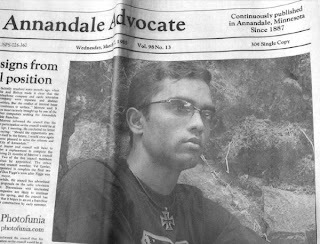 welkum to my oage a after a long time..
so waz in d newspaper...smthn as interestin as dat murder mystery?? Been thinking on the same lines since quite a while now...it is a good idea ! yes i am gonna release my book.. talked with preeti on that..
nice newspaper in the picture too..
thinking on the same lines? No.. tat was not nandy comment!! Actually i was logged in her account and i nly commented!! Then I realized my mistake and then deleted it, logged in to my account and then commented again!!! RS?! Sorry not able to recollect. Give me a clue!! u dunno the glamour gal of our class? LOVE LOVE LOVE.... now remember? something better.. i can imagine.. Rakhi sawant types!!! u are gonna be a celeb? so how u do it? no no.. some other news. I immediately got it about whom you were referring!! But i logged out and was too lazy to sign in back!! No anusha! Don't! Dont make chriz commit suicide. I pity you my friend. If anusha is really serious about it!! Ahaaaaaaa Chrizzzzzzzzzzzzy boy in the pappperrr.. Coolisicious! I know.. Anusha is one hyper kid!! But this time she really means to get back at you! !